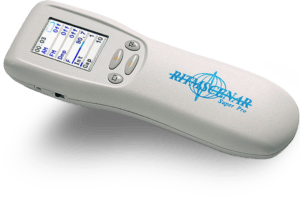 RITMSCENAR devices were recently cleared by the FDA for pain-relief. SCENAR transcutaneous electrostimulators are designed for delivering general noninvasive treatment via human skin areas for relief and management of a chronic and acute pain, as adjunctive treatment in the management of post-surgical and post-traumatic pain. by medical professionals in medical and prophylactic institutions – as an independent remedy as well as combined with other treatments. We are committed to providing you with the best possible service. Generally, most items are in stock and can be shipped within 24 hours. RITMSCENAR SCENAR devices come with a warranty package that includes a 2-year limited warranty. RITMSCENAR OKB, Inc. will repair, free of charge, any defects due to faulty materials or workmanship for two years from the date of purchase as long as the warranty seal is intact and there is no visible damage and it is accompanied with a warranty form. This warranty does not cover part failure due to normal wear or equipment abuse. This warranty does not apply to accessories or damage caused where repairs have been made or attempted by others. This warranty gives you specific legal rights and you may have other rights which vary in certain states or provinces. For further detail of warranty coverage and warranty repair information, click here or contact us. RITMSCENAR devices are covered by a 30-day money back return policy. If you are not completely satisfied with your RITMSCENAR device, for any reason, you can return it within 30 days from the date of purchase for a refund (excludes training, electrodes, accessories and shipping costs) – minus a 20% re-stocking fee – provided it is in the original box and free from damage. Customer is responsible for all return shipping charges. At RITMSCENAR OKB, Inc., your privacy is important to us. RITMSCENAR OKB, Inc. does not collect personal information about you (such as your name, address, telephone number, or e-mail address) unless you voluntarily submit that information to us through one of our Contact pages, subscription or by e-mail or other means. We treat the information in our customer database, including any information you, as a customer, submit through this website, as confidential and do not sell or otherwise disclose such information to third parties except under strict contracts involving customer service or the enhancement of our customer programs. When you visit our website, we may automatically collect certain non-identifying information about you, such as the type of browser or computer operating system you use or the domain name of the website from which you linked to us. In addition, we may store some information on your computer’s hard drive as a “cookie” or similar type of file. We use this information internally, to help us enhance the efficiency and usefulness of the website and to improve customer service. If you object to this, please consult your browser’s documentation for information on erasing or blocking cookies. Any information we gather, whether voluntarily provided by you or automatically collected, may be used for our internal business and marketing purposes but will not be sold or otherwise disclosed to third parties for any purposes. Notwithstanding any other statements or representations here or elsewhere on our website, we reserve our right to disclose any information in our possession if we are required to do so by law, or we believe, in good faith, that such a disclosure is necessary to comply with the law, defend our rights or property, or to respond to an emergency situation. If you are concerned about the information you have provided to us, or would like to review, update or delete that information, please contact us at scenar.usa@gmail.com. We will make reasonable efforts to comply with your wishes. If you do not wish to receive marketing or promotional materials from us, please send an e-mail to scenar.usa@gmail.com with the word “REMOVE ” in the subject line and re-type the e-mail address to be removed in the text of the e-mail for verification purposes. RITMSCENAR OKB, Inc., will take commercially reasonable measures to maintain the reliability, accuracy, completeness of personal information in our databases and to protect the security of our databases. We keep your personal information only for as long as reasonably necessary for the purposes for which it was collected or to comply with any applicable legal reporting or document retention requirements. Our servers and databases are protected by industry standard security technology, such as industry standard firewalls and password protection. The employees who have access to personal information have been trained to handle such data properly and in accordance with our security protocols. However we cannot guarantee against any loss, misuse, unauthorized disclosure, alteration or destruction of data. Most of the problems with RITMSCENAR devices about 60% come from using discharged or faulty batteries; the other 35% are mechanical damages of the devices. The faulty rate of SCENAR Home and Sport is extremely low – less than 1%. Sport D has a higher faulty rate due to LCD issues that already have been rectified. Over 85% of the Sport D problems resolve by replacing the battery and resetting the device. SCENAR Pro and SCENAR Pro+ faulty rate is also very low. RITM OKB ZAO innovative products are experiencing steady worldwide growth and we welcome new distributors to join us and share our success. RITMSCENAR OKB inc. is currently looking to expand its distribution network. We provide excellent support, product training, generous discounts and much more.